We’ve also just heard we’re getting our hands on the superb reference SL1000R record deck – one of the very few in the country. The Technics brand conjures up memories of great HiFi from the past (those of us old enough remember the 80’s gear fondly – much of which still works well today). This didn’t feel like it would fit in with our product range of super-high end Audiophile products from the likes of Linn and Naim Audio, However, they brought some kit over for us to play with and we were delightfully impressed. Their pedigree in turntables shines through, to the extent that we pulled out the cheque-book and ordered ourselves a stack of demonstration equipment. We want you to hear how good it is. Join us to put these excellent products through their paces – bring your own music if you want. We will be having a relaxed evening of music and refreshments. 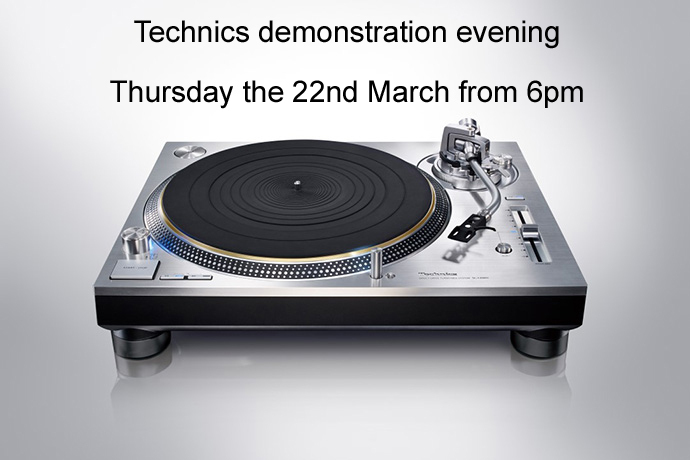 The guys with the knowhow from Technics will be on hand to answer your questions, and we are always happy to talk all things audio. The evening starts from around 6pm. Please reserve you free ticket here, so we have an idea of numbers to ensure we don’t run out of food and drink!